In the time we are living, even with low costs of technologies in studios, we must have in mind that the once powerful labels from the 80’s don’t put money into bands to patron their recording sessions anymore, due the prejudice caused by illegal downloads (to be simple: why they would put money on a record that no one buys?). If they do, only with two conditions: the artist is truly a best seller, or the material is amazing. But it isn’t an excuse for something recorded in a raw way. 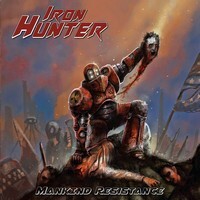 So the quintet IRON HUNTER shows that they still have to evolve a lot, for their first album, “Mankind Resistance” shows it clearly. First of all: they lack a more personalized musical work. They are another band influenced by this strange phenomenon of “rebirth of the 80’s” (and the laws of Physics forbids time travels), specifically by NWOBHM. It’s not a mistake to play an old Metal genre, but you must make something of your own, and although they have talent for the thing, they are still far away from something personal, reminiscent a lot of bands we all heard before. Maybe maturity can put things in their due ways. The second problem: they are trying with all their strength to put their tunes to be in the way of those bands from the first half of the 80’s. Sorry to destroy your feelings and dreams, but you are in love with the poor conditions and mistakes of recordings of the 80’s, not with reality. You can sound organic and crude, but not with this artificial insight. Musically, they show talent on all their songs, and individually, they have potential as musicians. This makes me want to see what their future will bring (in other words: I want to hear or review their next album). But for now, “In the Heat of the Night” and “Street Warriors” with their energy, the fast “The Deathbringer” (these high pitched screams could be left aside, please, because they aren’t fitting on your work), the excellent instrumental “Starchaser” (greatly influenced by IRON MAIDEN, as you can hear for yourselves), and “Beyond the Black Hole” are fine proofs of a band that really has too much to offer, but must leave aside the idea that they are a band from the Old School. You play Old School Metal, but you aren’t from the Old School, and hope you can understand the difference between these two things. Better luck next time, guys, but as I said: you have musical talent, so put it out of you hearts, and with a better producer.